As I mentioned earlier, the sixth trumpet involves judgment on Constantinople; the capital of the once powerful Roman Empire. The four messengers represent the four major cities controlled by the Seljuk and Ottoman Turks near the Euphrates river (Aleppo, Iconium, Damascus, and Baghdad). These four messengers were let loose after a period of an hour, a day, a month, and a year, which is 391 days. Again if we take each prophetic day to be a year, we get 391 years. This time period begins with the death of Togrul in 1063, who was the second ruler of the Seljuk Turks. Togrul took Baghdad in 1055 which was Islam’s capital as we discussed in the fifth trumpet. This shows a transition in God’s judgment from the fifth trumpet through Islam to the sixth trumpet through the Turks. The Turks later became known as the Ottoman Turks under Osman I in the early 14th century. Next, Revelation talks about horses that shoot out fire and brimstone from their mouths. 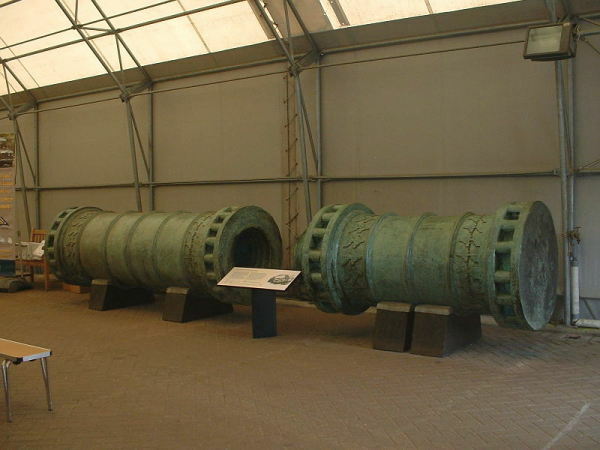 These are referring to the cannons that the Ottoman Turks used to conqure Constantinople in 1453, which is the 391st year from the death of Togrul in 1063. Below is a picture of the Dardanelles Gun which was used in this battle. It is currently on display at Fort Nelson in England. This last passage says that even though many were killed for their sins, the ones that survived did not change their ways. People continued to worship demons, idols, money, commit murder, sorcery, prostitution, and theft. Therefore, more judgment must take place if all is to be restored.